Pinterest, the image based social media site, tends to attract participants interested in home decorating, crafts, fashion, and food. Regardless of your business focus, you need to better understand what Pinterest has to offer your business and its social media marketing. Pinterest participants are deeply involved. 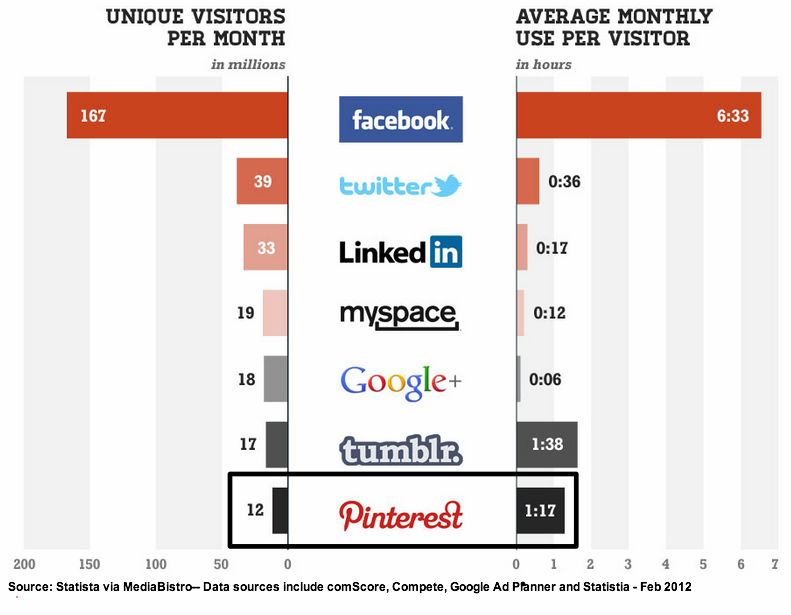 They spend an hour and seventeen minutes per month on Pinterest according to Statistica reported by AllTwitter. They only spend more time on Tumblr and Facebook. Pinterest encourages viral activity as shown by the number of repins. 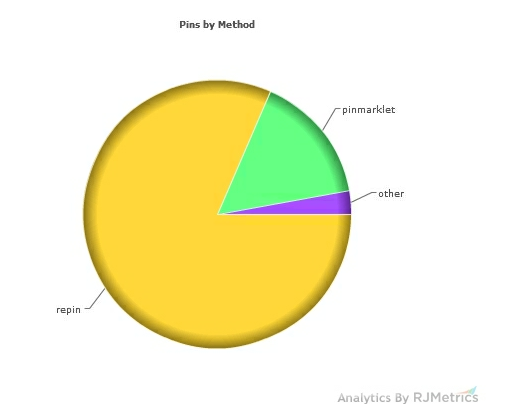 Specifically over 80% of pins are repins as reported by RJ Metrics. This makes sense since repinning is significantly easier than searching for new content, checking whether it can be pinned and writing a description. 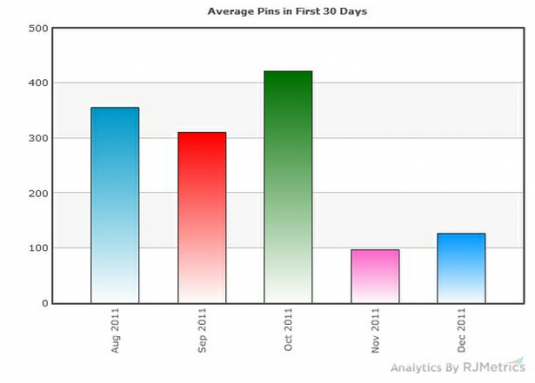 Pinterest’s high growth has resulted in erosion in the quality of new users as seen in the number pins in the first month by new members via RJ Metrics. As with any marketing plan, it’s critical to understand your target audience. 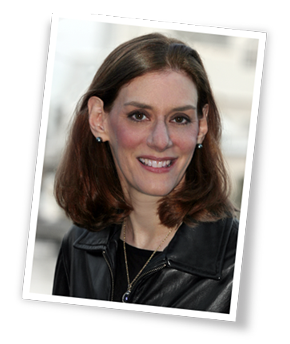 Where social media’s concerned, develop a social media persona. Here’s information about Pinterest’s audience to help you. 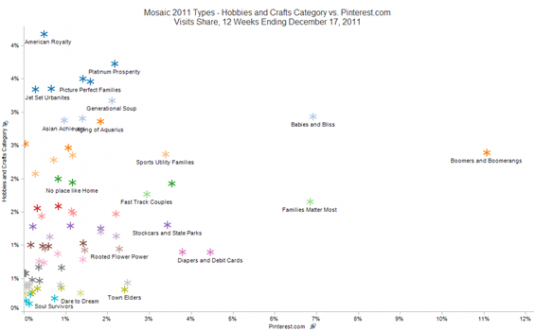 Women dominate Pinterest as they do many other social media sites. About three fifth’s of the visitors skewed female (58%) as reported by Experian Hitwise for the 12 week rolling average ending December 17, 2011. About 70% of US pinners have a household income of $25,000-$74,999 according to comScore. Further, about a quarter of Pinterest users have a college degree or higher. Most pinners (roughly 60%) tend to be in their mid-twenties to mid-forties based on Experian Hitwise’s 12 week rolling average ending December 17, 2011. Based on Mosaic USA‘s 2011 types, this segment is called Boomers and Boomerangs; they account for over 10% of Pinterest visits. These individuals tend to be heavy web users. 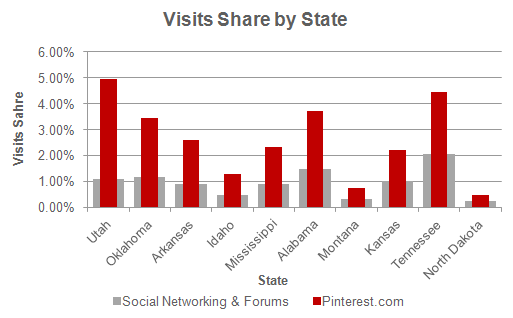 Pinterest has a higher percentage of visitors from Northwestern and Southeastern states while social networking platforms in general over-index for Northeastern state visits, both Pinterest and social networking platforms receive the largest share of visits from California and Texas according to Experian Hitwise data. This may be attributable to the size and population of these states. US pinners are interested in crafts, special event items, hobbies and leisure, interior design, fashion and blogging resources according to Visual.ly. 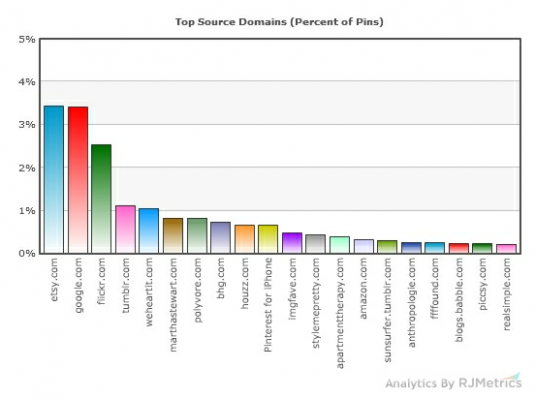 Etsy, Google and Flickr are top sources of content to pin. Research by RJ Metrics revealed that there’s broad diversity in the content members pin. 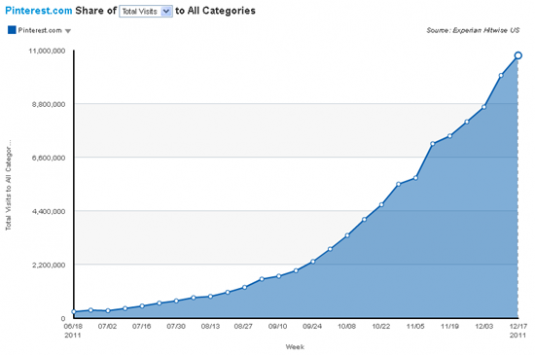 What’s Pinterest’s strength in referral traffic? 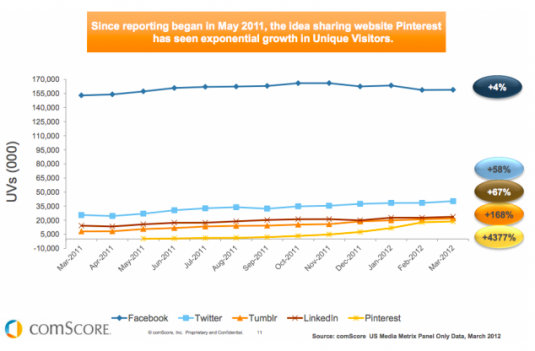 Pinterest is growing in its ability to drive traffic to other sites. 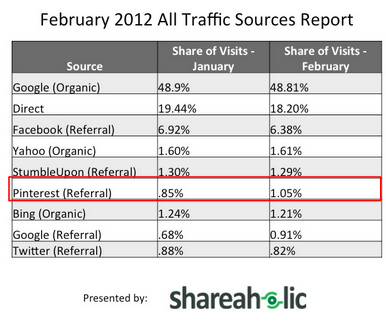 In February, Pinterest referral traffic surpassed Twitter while Facebook’s referral traffic declined according to Shareaholic data. This has important implications for marketers looking to use Pinterest to drive prospects to their website. 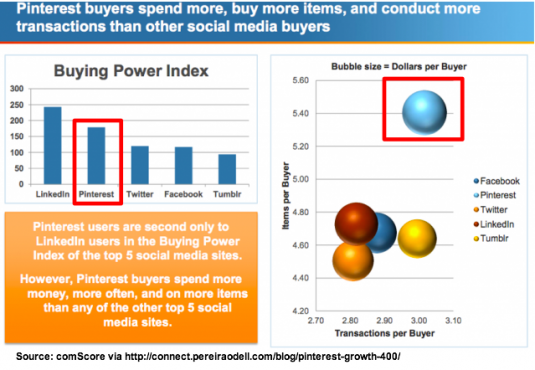 Want buying power from a social media site? Pinterest’s partitipants’ buying power is only second to those of LinkedIn. Given the B2B nature of LinkedIn, it’s possible that these transactions tend to be larger in size. Pinterest shoppers spend more, buy more items, and make more purchases than other social media buyers including Facebook and LinkedIn according to comScore. 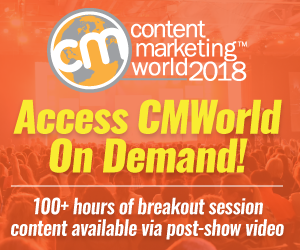 Looking for sales from social media? Then include Pinterest in your marketing mix based on data reported by Monetate’s Kurt Heinemann reported this data in All Things D.
Pinterest made up 26% of social traffic to retailers in 1Q12 up from 1% the year before. 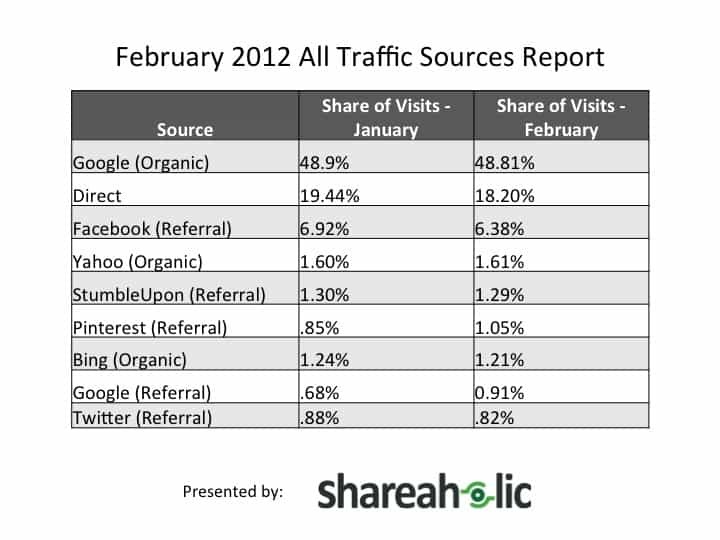 By contrast, Facebook comprised 60% of the social traffic to retailers in 1Q12 down from 88% the year before. Pinterest received $100 million investment from Japanese firm, Rakuten as reported by All Things D. This investment raises Pinterest’s valuation to $1.5 billion. In part, this is attributable to Pinterest’s meteoric growth as well as its ability to drive sales for diverse businesses. Given Pinterest’s visual nature and its participant base’s interest in hobbies, decor and clothing, it’s not surprising that most of the top brands fall into one of these three categories. The top 10 most popular brands on Pinterest were as follows based on Statista’s analysis of follower numbers in February 2012. Given Pinterest’s easy-to-use nature combined with its visual focus, here’s a list of Pinterest’s 10 most active pinners based on the number of followers as reported by Statista’s analysis of follower numbers in February 2012. Given the power of photographs and images in social media today, adding Pinterest to your marketing mix is a must-have. To make an informed decision as to how to use Pinterest effectively, it’s important to understand how this social media site is evolving as indicated by the research. What other Pinterst data would you add to this list? Please reference your sources. Tags comScore, data, Hitwise, Pinterest, Rakuten, Research, RM Metrics, Shareaholic, Visual.ly. Bookmark the permalink.